Мега-сравнение лучших экшн-камер: GoPro Hero 7 и Sony FDR-X3000. Какая всё-таки лучше? Hello everyone, we are located near Tokyo, on the left is the ocean. Today, great weather and a great opportunity to compare two action cameras, the best action cameras for today:. 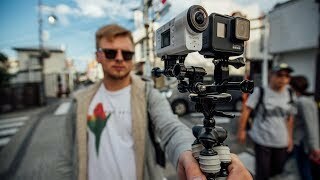 Sony FDR-X3000 and GoPro Hero 7 Black. You already have to decide which is better, which one to buy, and you also noticed that I have such an unusual setup in my hand.. This is a mobile tripod, a bunch of bolts, screws, from a set of GoPro, so that two cameras stand exactly,. So that they could come face to face and understand already: - “What to buy?”. But here it is worth making a small reservation ... Since GoPro Hero 7 was released a couple of months ago, and the Sony camera over two years ago. Therefore, in this review we will talk more about GoPro and compare it with the X3000. Secondly, the Sony camera before the release of GoPro was the best, or remains the best, we’ll find out at the end of the video.. But in any case, no one is to blame for the fact that Sony is not releasing updates, they could have done it, so let's compare!. Where do we start? GoPro is available in 3 versions: White is the cheapest, Silver is the middle segment, and this is the Black top version..
All three got the screen, the same aperture ratio, the same size of the matrix, Wi-Fi, Bluetooth,. USB Type-C, protection against water with immersion up to 10 meters and support for MicroSD. The only difference is the angle of capture line, the number of megapixels and frames, in the resolution of the recorded video, and the presence of micro-HDMI and monochrome screen in Black version..
All characteristics in front of you - pause and review. And here is Sony to compare with the Black version. Official prices in Russia: 18,000, 27,000, and 35,000 thousand rubles. Sony FDR-X3000 costs 30,000 rubles for the minimum configuration..
Great opportunity to check video stabilization now: It is turned on both cameras, now you are watching a picture with GoPro Hero Black, and now Sony FDR-X3000..
You can compare who is better and who is worse and make some preliminary conclusions without waiting for the end of the video..
All the controls that she Hero that Action-Cam familiar to you. Here everything is on the screen, on the other hand a monochrome screen with icons is very convenient.. In fact, Sony has a control panel that is hung on the arm, but in its standard configuration it is not, in general, it is really impossible to use Sony..
And here you can say that the management is perfect.. In general, the GoPro control-panel deserves just a separate praise, because it is really very convenient, there is a touch screen, everything is clear, unlike Sony, everything is shown by icons on a black and white screen, and if only because of the control, I would choose GoPro.. Yes, this is the worst thing - GoPro in fact is a small Android smartphone,. Empirically we found out what’s inside is Android modified, which version is not clear, but File Transfer on Mac defines this device exactly as Android.. So, everything is clear with the settings. In front of the monochrome displays basic information about the battery, number of frames, memory and so on. This is a touch screen, very bright, now 10% brightness..
Swipe from top to bottom opens the curtain, here you can go into the parameters, everything is also convenient to configure,. Touch screen, regional settings, voice control is available by the way, let's talk more about that.. If you do the swipe from the bottom, then all the taken photos and videos are included, there is no microSD here now,. Then it was relevant. Now there is no. We're talking about top action cameras and Sony comparisons, Probably, the camera Xiaomi should be compared with the Light-version, but today we have Black..
What are the differences between version 7 and version 6? External changes are very few, this is the same plastic case, rubberized, better than Sony, here GoPro benefits again, because it also protects against falling,. Looks better and more pleasant to the touch. Over the two years of using the X3000, many have noted that Sony is made simply from plasticine, I just breathed and there were already scratches and chips appeared, but there is a minus in GoPro: to insert a memory card or charge it, you need to remove it from the case,. Which sits quite tightly, but in no way protects it from water, and probably from falls, too..
Type-C is under this case - this is inconvenient, but the MicroSD card is inserted normally, unlike Sony.. There it can be inserted by any side and it infuriates, because every time I inserted it in the wrong direction, plus Alexander Lyapota from the Keddr channel said,. That with strong blows the card just goes away and you lose files. In general, it is annoying. Why did the Sony engineers make such a mistake? By the way, GoPro uses almost any MicroSD to record 4K 60fps..
Because I inserted different cards, everything was fine. Probably the old bad ones will not be read, but on the whole there were no problems..
Why am I talking about this? Because to record video in normal bitrate on Sony you need to insert a special UHS-I hyper-4G SuperSpeed ​​and so on.. In general, we need some kind of native cards, we had to buy 32 GB for 4.000 rubles - this is a little expensive!. So this is also a minus for Sony and a plus for GoPro. Let’s return to the differences of the 7th from the 6th version. The most important thing is stabilization, it finally appeared here! But it is electronic, not optical like Sony, unfortunately. But during the day it works just perfect, the picture floats like water. But the mode cuts the frame by 10%, the notification warns about it. And at night, stabilization does not work, believe me, still shaking as much as Madison Ivy in her famous works ... Also, do not forget that HyperSmooth is only in the Black version, plus you can write a great hyperlapse and timelapse, and here there is a function called TimeWarp.. It works very well, but most importantly, it records video files, not a bunch of photos like other cameras do, including Sony..
Plus stabilization works, it works perfectly, Please note that the shooting in the subway was carried out with artificial light. As for me as a whole, it looks very good, and specifically for such purposes this camera fits perfectly..
Well, you can make good photos in daylight. Again, compare this to Sony, this is GoPro - everything is clear here. GoPro has a better color and overall the photo looks more presentable.. Applications. GoPro - as usual, super convenient, superlogical, you can control the camera directly from it, include video, take a photo, hyper-lapse and time-lapse, in general, whatever you want!. Additional remote control is not needed. Turn on from the phone, Wi-Fi, turned on and enjoy. Switching modes, settings, and so on everything is there. You can view the files, immediately transfer them to the iPhone, by the way, you can shoot GoPro Stories for up to 15 seconds,. So as not to cut off such a mode but download it to Instagram immediately. Very comfortably.. The application is excellent, we can say that it is a reference. If we talk about Sony, it's just a shame. I will not even show it. It is terrible and again, another point to the GoPro..
What else? The camera can shoot in a vertical position, to do this, just flip it over, turn over the interface,. Click, shoot. At the same time the monochrome display also turns over. And the latest - voice commands. Which work fine, yes, I will never use these, just tried it and it's very cool. - GoPro, shoot the video! Shooting started, the button is on. It works great, understands the Russian voice. Total, what conclusions can be done? Despite the fact that the Sony camera is in fact ancient, it is still one of the best action cameras:. It has a great sound, and most importantly, it has a much better sound than GoPro. GoPro recently released a firmware update, that was shot in Japan before the update, Now the sound is a little better. Let's try, how can I hear? Hello! In any case, the sound on Sony is still better, you should put up with it. What other advantages are there? (Sony) This is the usual mount for a tripod, ergonomics are a bit more convenient, and the mini-jack 3.5 output is for the microphone, it isn't in the GoPro.. It turns out that Sony has not so few advantages, now let's talk about GoPro. We have already figured out the minuses - this is sound. But of the benefits is the presence of the screen, perfect control, perfect application, good stabilization, excellent hyperlapse and timelapse, which are already built in here, support for any microSD, Type-C, protection against water and dust, the front screen is monochrome, which shows information, various modes, the availability of ProTune,. 4K recording 60 frames per second, FullHD 240, Sony has 30/120 frames per second ie twice less, respectively. Plus, if you take GoPro not the Russian but the American version, then it will cost less than the basic X3000 equipment in which there is no remote, I'm talking about the Black version, of course. So I think the pros are a little bit bigger. In fact, if you throw away the jokes, then the child understands that you need to take GoPro. Now comparing Sony, because GoPro has many times more benefits, and if the sound is really not very important to you, then without any problems the best action camera for today is GoPro Hero 7.. If the sound is important, then most likely you will have to write on something separately, you can connect an external microphone, Yes, Type-C is covered with a case, but in any case, the people somehow get out and come up with something..
Really cool camera, excellent stabilization, and in fact this camera saved the company, because when they released the Hero 5 disgusting camera, Hero 6 was just as disgusting, then I thought it was the “sunset” of the company. Xiaomi shot better! But they did it this time, which is good, because this company came up with and made action cameras. So congratulations on the rebirth. As for White or Silver, I think that there is no point in taking them. If you want to spend less money, then take the same Xiaomi. It costs a penny and shoots about the same.. If you want the best action camera for today, this is GoPro time. As for Sony, it makes no sense to take it, because the camera is already three years old. Perhaps they will now present a new version on the MWC. We’ll see… but for now: Hero 7 Black is the best action camera that can be advised to buy.. I want to remind you that we have a Telegram channel, in which we post the video earlier than on YouTube, so it makes sense to subscribe. But like all the other social networks, Recently, someone won a phone in VK, where have you been at this moment? Subscribe to the channel as well!